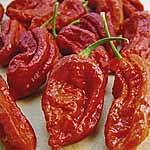 For lovers of hot chillies Chilli Bhut Jolokia is unsurpassable! Measuring in at 1,000,000 units on the 'Scoville scale!, it's a very very very hot pepper! Ideal for pot or greenhouse growing, it produces an abundance of 5-8cm long, orange/red pods, which can be frozen but are better dried. Our community of gardeners have a wealth of experience, beautiful garden and great photos, discover more on the following pages: chilli pepper, grow your own.